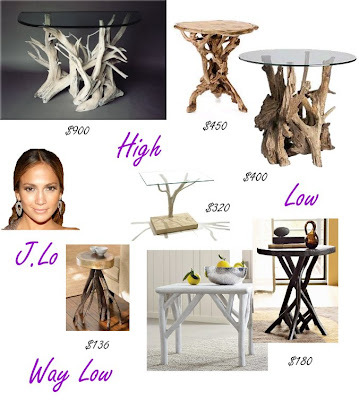 Clockwise from top left: Driftwood Art Butler console table, Anthropologie Million Rings side table, Crate and Barrel driftwood end table, Harry Allen branch table, West Elm branch side table and square branch side table, Viva Terra tree slice table, J. Lo with dangly earrings. Here's another how-to. The results look a little Dr. Seuss, but the principle could be applied to some nice Lake Erie driftwood. I actually saw that tutorial to make the lamp shades! very cool. thanks for the comment!